Dwayne 'The Rock' Johnson is missing shooting 'Jumanji' on location in the jungle - because he can no longer terrify Kevin Hart by "throwing venomous spiders on him". The two actors have been busy shooting the family action film, which is a continuation of the story from the 1995 film of the same name starring the late Robin Williams, for the past few months and have spent a lot of time in wild jungles in Hawaii. Now, Johnson and Hart - who appeared together in action/comedy 'Central Intelligence' - are filming their green screen scenes and although the former WWE wrestler loves working with the CGI experts he is missing being able to give his co-star arachnid angst. 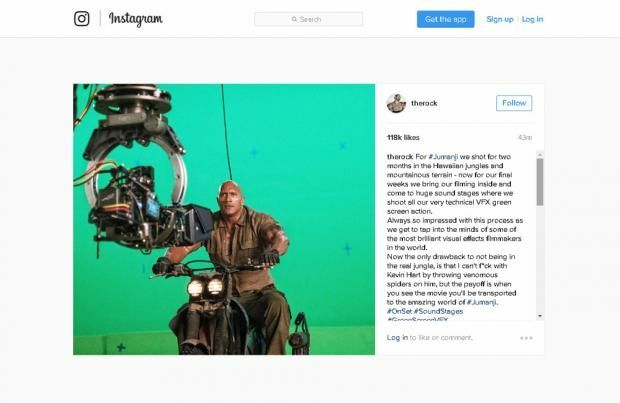 In a post on his Instagram account - accompanied by a photo of himself sitting on a motorbike in front of a green screen - Johnson revealed: "For #Jumanji we shot for two months in the Hawaiian jungles and mountainous terrain - now for our final weeks we bring our filming inside and come to huge sound stages where we shoot all our very technical VFX green screen action. "Always so impressed with this process as we get to tap into the minds of some of the most brilliant visual effects filmmakers in the world. Now the only drawback to not being in the real jungle, is that I can't f**k with Kevin Hart by throwing venomous spiders on him, but the payoff is when you see the movie you'll be transported to the amazing world of #Jumanji. #OnSet #SoundStages #GreenScreenVFX #IStillNeedToF##kWithHart #Jumanji (sic)"
Before filming took place in Hawaii, Johnson and the rest of the 'Jumanji' cast - which includes Jack Black, Karen Gillan and Nick Jonas - and director Jake Kasdan were blessed by a local priest. Hawaiian Kahu Cordell Keka blessed the film with a "powerful aloha" to ensure the "spirit of laughter, enjoyment and love" was present throughout the shoot. Four high school teens in detention discover the magical board game Jumanji, now a video game, and after being sucked into it they become the avatars they’ve chosen. Crude but amusing sequel to the 1995 original, with Black having a ball as he gets in touch with his inner prom queen.